Thank you, John and Allen | Waccamaw Community Foundation | Connecting donors with causes they care about. With the end of the year drawing near, so too does the end of two board members’ terms: John Draughn and Allen Jeffcoat. Both John and Allen have been great assets to Waccamaw Community Foundation over the years. We said goodbye at our last board meeting of the year, where both John and Allen were presented with congratulatory awards by David Bishop, Board Chair of WCF. John Draughn is currently a member of our Grants Committee and has now wrapped up nine years of board service. A fundholder at WCF, the most interesting part of his experience as a board member has been learning exactly what community foundations do – planned giving is paramount. 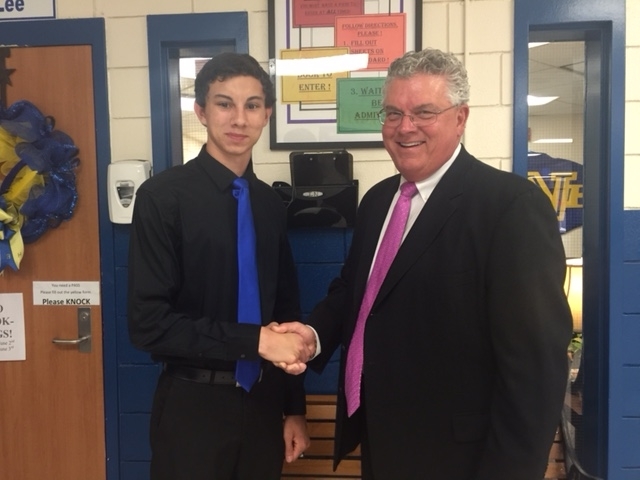 John with a Jadon Tyler Reed, 2016 scholarship winner from one of his funds. Allen Jeffcoat has practiced as an estate lawyer in Myrtle Beach for 40+ years and first joined the WCF board in 2007. A member of the Development Committee, working with WCF has taught him about the many ways donors can carry out their charitable giving by working with WCF. Allen at his office in Myrtle Beach. Thank you again, John and Allen for your dedication to Waccamaw Community Foundation! 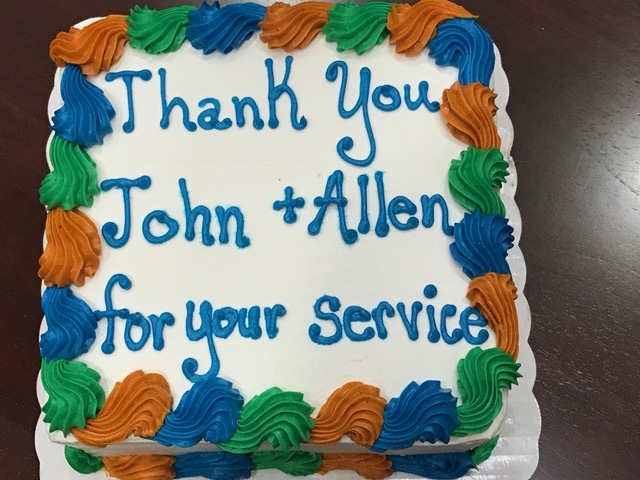 Celebratory cake from John and Allen’s last WCF board meeting. Stay tuned in 2017 to meet our three new incoming board members!